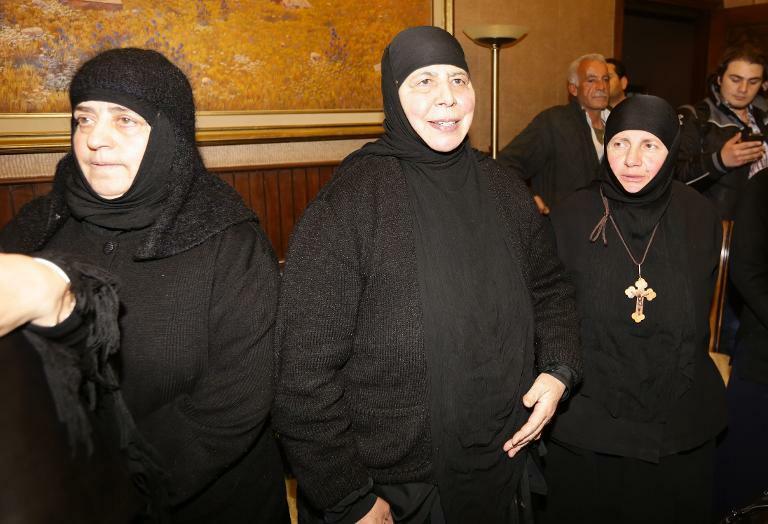 Damascus (AFP) – A group of nuns held by Islamist rebels in Syria were freed Monday in a prisoner swap with Damascus that brought a rare ray of hope to the country’s beleaguered Christians. Scores of faithful packed the ancient Church of the Cross in the heart of the capital to welcome the nuns as they joined a mass to celebrate their freedom after more than three months of captivity. 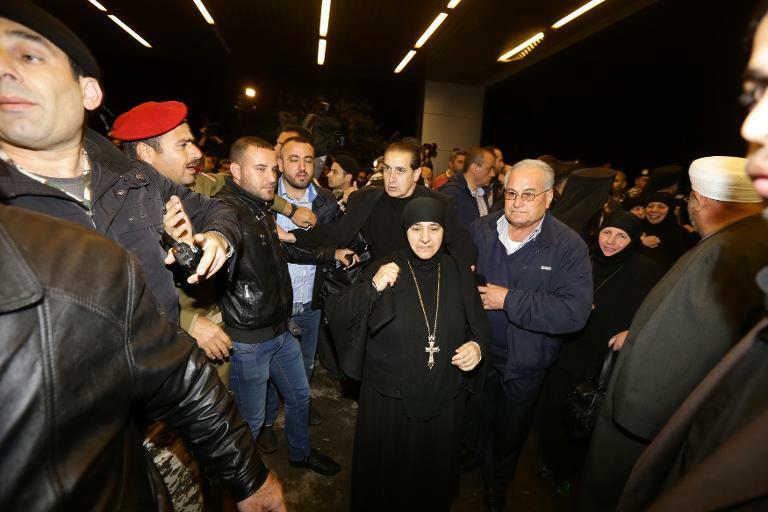 The 13 nuns and three maids, who had been seized by Al-Qaeda fighters on December 3, were released in exchange for some 150 female detainees held in Syrian government jails in a swap brokered by authorities in neighbouring Lebanon. They arrived in Damascus at the end of an arduous overland journey lasting many hours that saw them driven from the rebel-held town of Yabrud into Lebanon and then back into Syria via the official crossing. 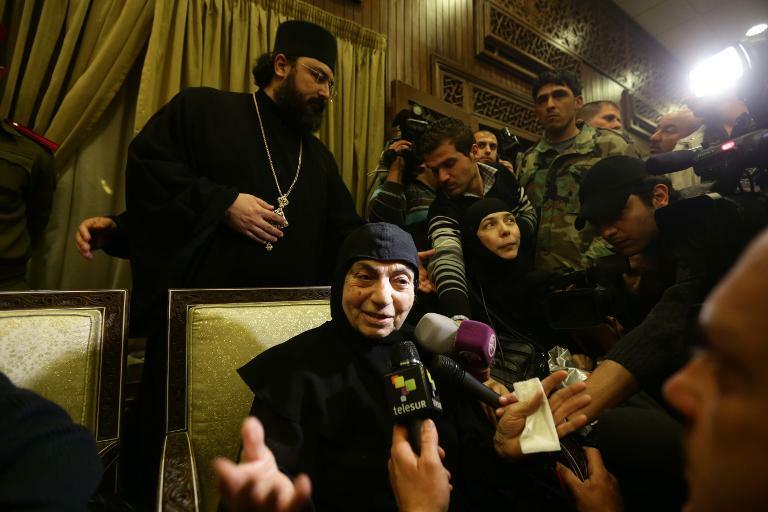 “We want to thank God, who made it possible for us to be here now,” one of the Greek Orthodox nuns told reporters as she arrived in Syrian government-held territory. She thanked Syrian President Bashar al-Assad and Qatari Emir Tamim Bin Hamad Al-Thani, a leading supporter of the opposition, as well as Lebanon’s General Security agency director Abbas Ibrahim, who mediated the exchange. She said their kidnappers from the Al-Qaeda-affiliated Al-Nusra Front had treated them well. “No one bothered us,” she said, denying rumours the kidnappers had forced the Syrian and Lebanese nuns to remove their crosses. The 16 women had been seized from a convent in the Christian village of Maalula, where residents still speak a version of the Aramaic language of Jesus Christ, before being held captive in Yabrud, now the target of a major regime offensive. Video posted online by activists showed the women being escorted to a transfer point by opposition fighters. One nun was carried to a van by a fighter whose face was wrapped in a black scarf. The van and other vehicles in the convoy flew the black flag used by jihadists. At the transfer point, the nuns moved forward as government security forces handed over a first woman prisoner and her children. Their release came as pro-government forces put the rebels under mounting pressure in Yabrud, their last stronghold in the Qalamun mountains between Damascus and the Lebanese border. “I have a lot of hope. This (war) is just a dark cloud, and it will pass,” said Maryam Dahdal, 45. “I hope the two bishops and all the missing will return soon too,” said a 65-year-old lawyer, who declined to give his name. He was referring to bishops Yohanna Ibrahim and Boulos Yaziji, who were abducted by suspected jihadists early last year, and whose fate remains unknown. Syria’s Christians, who make up some 10 percent of the population, have tried to keep out of the three-year-old conflict that has torn apart their country. But fear of the Sunni Muslim-dominated rebels is widespread and the community has been targeted for its suspected sympathies with the secular regime of President Bashar al-Assad. Among opposition activists it was the release of the nearly 150 women prisoners who were bussed to the Lebanese border that was met with celebration. “Most have returned to Syria because they want to be with their families,” activist Hadi al-Abdullah told AFP via Skype. “The operation is a success because we are the winners,” he added. More than 140,000 people have been killed since the uprising against Assad’s regime erupted in March 2011. Another 2.5 million people have fled abroad while 6.5 million have sought refuge inside the country.